Good for both those new to meditation as well as experienced meditators. In this contemporary stressful world, it can be difficult to manage our self care. Join us to learn about the physical and mental benefits of meditation. We will provide an introduction to the practice of meditation, including a sample of techniques that are easy to engage in. This program should be of value to those new to meditation as well as experienced meditators who would like to expand their repertoire. Admission: $5.00 (All proceeds benefit the reconstruction of the Schoolcraft House) Ages 12 and up. Since seating is limited, please let us know if you plan to attend. Contact Jamie Sharma at jamie.sharma@hotmail.com to reserve a spot or if you have any questions. Take both sessions for a full and complimentary experience. The morning session will prepare you for a deeper journey in the afternoon! Or attend either session separately. 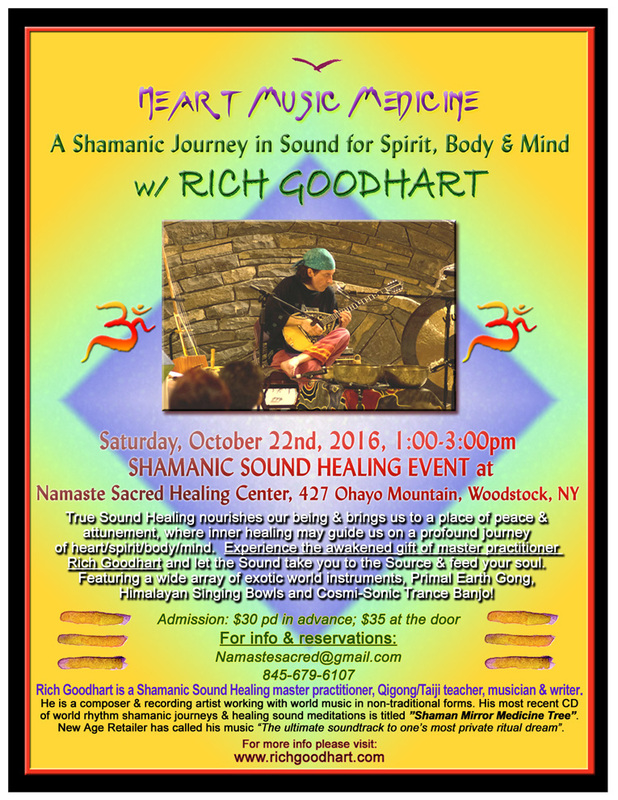 practitioner Rich Goodhart and let the Sound take you to the Source  let it feed your soul. sanza, shakers and the one and only Cosmi-Sonic Trance Banjo!! $45 Registered and paid in advance by Tuesday, April 4th. $50 after the 4th or at the door. Morning session only: $25. Afternoon session only: $30. where inner healing may guide us on a profound journey of heart/spirit/body/mind. you to the Source & feed your soul. of stunning Himalayan Singing Bowls and the one and only Cosmi-Sonic Trance Banjo!! retreat which will include several other presenters. ORENDA, a supernatural force believed by the Iroquois Indians to be present, in varying degrees, in all objects or persons, and to be the spiritual force by which human accomplishment is attained or accounted for. Come together for a day of self expression, self love and group work with a unique combination of methods, philosophy and experience honoring that force within all that helps us live a better more fulfilling life. you to the Source and feed your soul. With guest vocalist Ali Schmidt. $45 Registered and paid in advance by Tuesday, October 10th. $50 after the 10th or at the door. 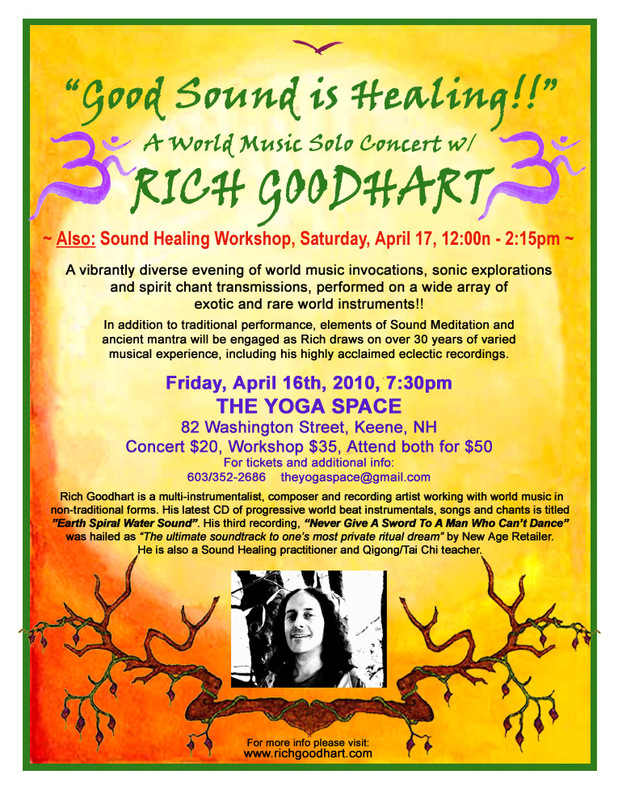 Rich Goodhart and let the Sound take you to the Source & feed your soul. Cosmi-Sonic Trance Banjo! Great self-care offering to prepare for the coming holiday rush! $20 Registered and paid in advance. $25 at the door. $30 Registered and paid in advance. $35 at the door. $25 Registered and paid in advance. $30 at the door. field of a 32" WUHAN GONG and a collection of amazing ANTIQUE HIMALAYAN BOWLS! $22 Registered and paid in advance. $25 at the door. Recent work by Thom will be on display as well as art posters available, and opportunity to meet the artist. well as the new Cosmi-Sonic Trance Banjo!! Saturday - Sunday, June 20-21, 2015, 7:00pm Saturday to approximately noon Sunday. heart, spirit, mind and body. access to our innate wisdom, to heart aware healing, and to renewed vitality, inspiration and self-guidance." Gong, Antique Himilayan Singing Bowls, Native American flute, hand drums, voice and more. 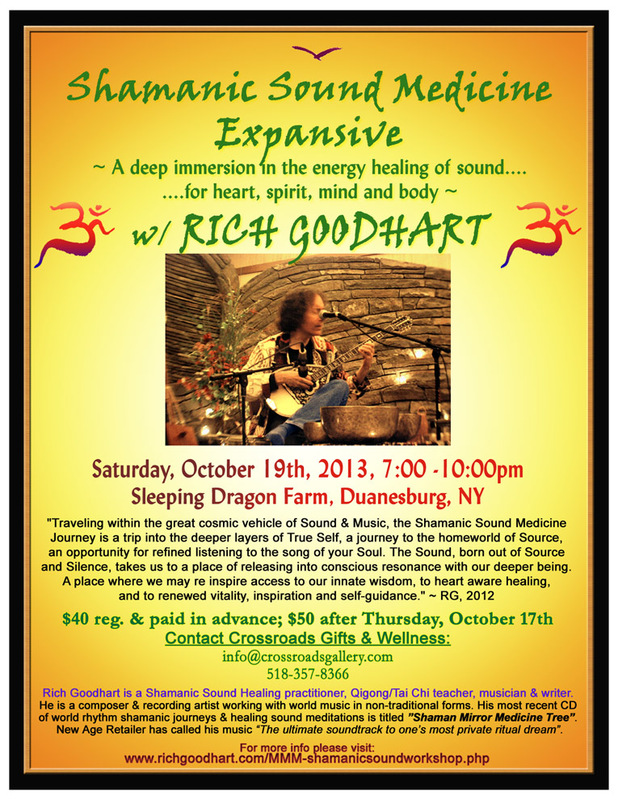 $108 paid in advance, includes Saturday evening 3 hour Shamanic Sound event, overnight accomodations and Sunday morning Qigong/Sound Meditation Session. Make checks payable to: SRV Retreat Center and mail to the address above. Please write 'Solstice Retreat' on the envelope. $120 and $45 if paid on the day of. Saturday event begins at 7:00pm, but feel free to arrive earlier to check in to your room and get comfortable. Please bring snacks & any special requirement foods. We will be providing a simple eggs and toast breakfast for all. If you prefer to sleep in a tent, please bring one, there is plenty of land and you are welcome to do so! We highly encourage you to make reservations in advance, thank you! vibrational field of a 32" WUHAN GONG and a collection of amazing ANTIQUE HIMALAYAN BOWLS! deepens ones connection with the forces and rhythms of nature. healing and life affirming alternative grounded in one's true essence and birthright as a human being. $70 for all 5 weeks..
$20 in advance, up to March 19th. $25 after March 19th and at the door. 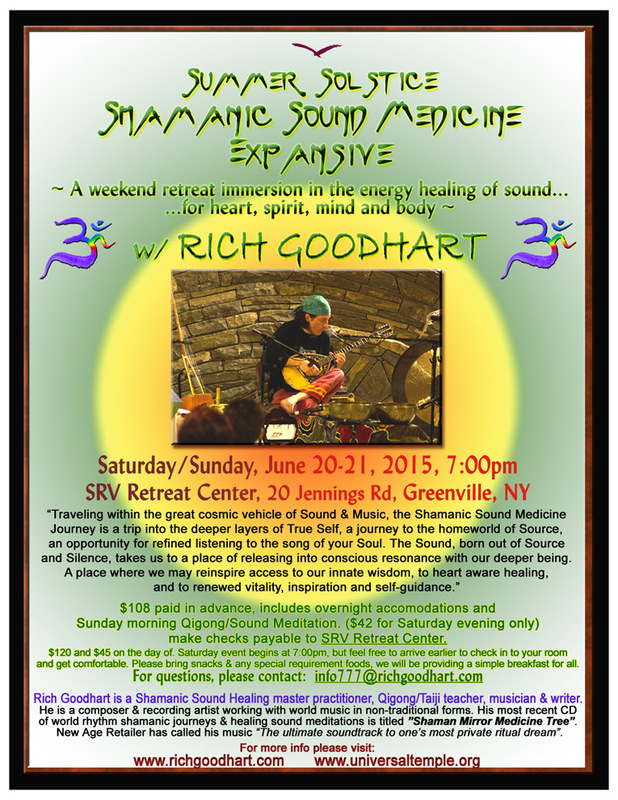 A Shamanic Journey / Healing Sound / Energy Medicine Experience. You must make reservations in advance, you will then be given location & directions. A Sacred Journey Through Sound (World Music/Healing Sound Event) ~ w/ percussionist Adrian Bennett. Numinous & The Greater Albany Meditation Project. $20 Registered and paid in advance. $23 at the door. Friday, July 12th, 2013, 7:30pm ~ RETURN ENGAGEMENT, due to enthusiasm from last month!! A Shamanic Journey / Healing Sound / Energy Medicine Experience, to accompany an art creating experience hosted by Alex & Allyson Grey. For more information, please visit the CoSM page. $10 Registered and paid in advance, $15 a the door. or visit the CoSM website. For Info and reservations call or stop in at Crossroads Gifts & Wellness, Jay St, Schenectady. A Workshop / Energy Medicine Experience. ~ For event description please view this link. A Sacred Journey Through Sound (World Music Concert) ~ w/ percussionist Adrian Bennett. ~ For event description please see flyer below and also view this link. as well as discussion about the upcoming Sound Healing and Concert events of the next two days. Live Radio Interview on WSRN-fm, "Leave It To Cleaver" show. WSRN, broadcast online. Hosted by Steve Cleaver. I will be performing on Friday evening & presenting a workshop on Sunday. An open drum circle will follow an hour performance at 2:00pm. from the double CD of the same name. ~ SHAMAN MIRROR MEDICINE TREE ~ control, sorry. Plan to reschedule. Afternoon Temple of Sound Workshop & Evening Kirtan, ~ I'll be accompanying him for both events. 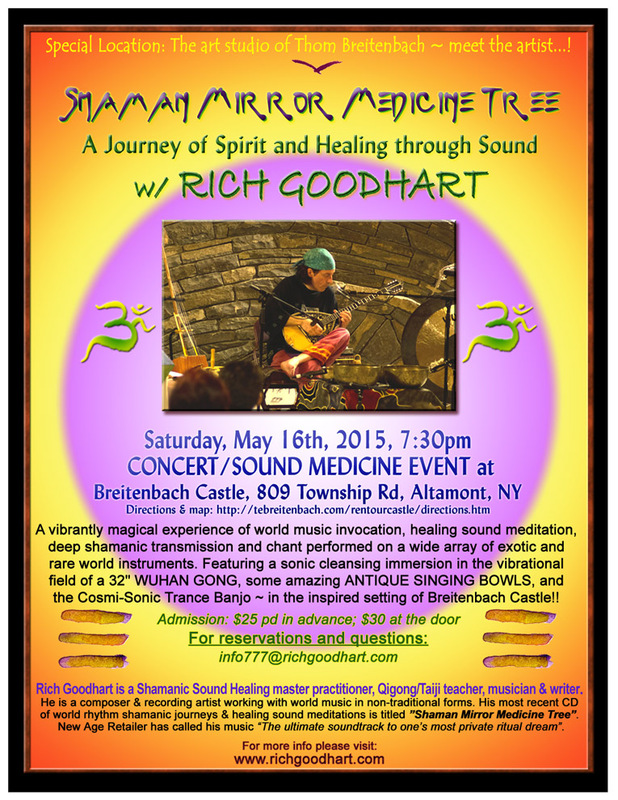 A World Music/Healing Sound SOLO CONCERT & CD Release Party!! An open drum circle will follow the performance. 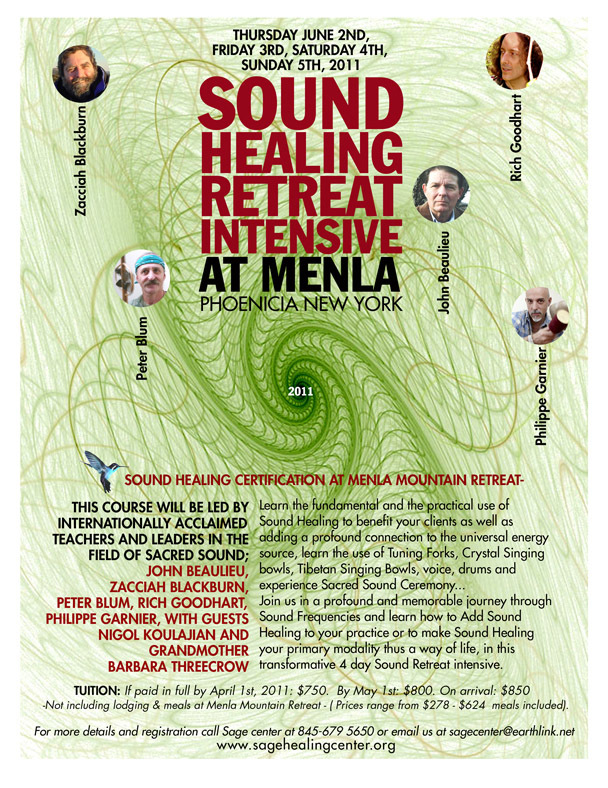 as part of the Sound Healing Network Conference at Omega. "EXPERIENCE THE TRANSFORMATIVE POWERS OF SOUND"
There is an enormous resurgence of interest in the 13th century mystical Persian poet Rumi. He is the greatest exponent of the ecstatic intoxication of sacred love. Shahram Shiva, Rumi translator and author, captures the essence of the poet's message through his passionate performances. The union of spoken verse and live music - Rich Goodhart on stringed, wind and percussive world instruments - melds magic with love. With special guest Steve Gorn on bansuri flutes. To complete the evening Shahram invites the audience to join him in an ecstatic and meditative whirling experience with Rich's live drum accompaniement. Live Radio Interview on WXBC, "Leave It To Cleaver" show. WXBC, broadcast online. Hosted by Steve Cleaver. Live Radio Interview on WRPI, "In The Spirit"
WRPI, 91.5FM Hosted by Gary Goldberg. transmissions, performed on a wide array of exotic and rare world instruments!! In addition to traditional performance, elements of Sound Meditation and ancient mantra will be engaged as Rich draws on his many years of varied musical experience, including his highly acclaimed eclectic recordings. There is an enormous resurgence of interest in the 13th century mystical Persian poet Rumi. He is the greatest exponent of the ecstatic intoxication of sacred love. Shahram Shiva, Rumi translator and author, captures the essence of the poet's message through his passionate performances. The union of spoken verse and live music - Rich Goodhart on stringed, wind and percussive world instruments - melds magic with love. To complete the evening Shahram invites the audience to join him in an ecstatic and meditative whirling experience with Rich's live drum accompaniement. Join David and Rich for an evening of pure deep sound journey exploration transmissions! For details contact the email address on my Home page. World music ensemble featuring Kevin Nathaniel Hylton: mbira, shekere; Salieu Suso: Kora, voice; Tripp Dudley: tabla; John Ragusa: flutes, conch, jaw harp etc. Guest performer with: OCTOBER PROJECT!! I'll be guest performing as percussionist with this world reknowned critically acclaimed classic progressive band which includes original members Marina Belica, Julie Flanders and Emil Adler. They had two albums on Epic Records before leaving that label and have since taken some time off, but are back together recording and performing again. There is an enormous resurgence of interest in the 13th century mystical Persian poet Rumi. He is the greatest exponent of the ecstatic intoxication of sacred love. Shahram Shiva, Rumi translator and author, captures the essence of the poet's message through his passionate performances. The union of spoken verse and live music - Rich Goodhart on stringed, wind and percussive world instruments - melds magic with love. With special guest Vicki Richards on violin. To complete the evening Shahram invites the audience to join him in an ecstatic and meditative whirling experience with Rich's live drum accompaniement. Not really a concert, but I'll have an assortment of instruments with me and will be performing and available for "meet and greet", promotion of my Sound Healing, Qigong, CDs and performances, general conversation, astounding displays of unbelievable magic and handless headstands. Come out, say hello, do some Christmas shopping and support a great little store! There is an enormous resurgence of interest in the 13th century mystical Persian poet Rumi. He is the greatest exponent of the ecstatic intoxication of sacred love. Shahram Shiva, Rumi translator and author, captures the essence of the poet's message through his passionate performances. The union of spoken verse and live music - Rich Goodhart on stringed, wind and percussive world instruments - melds magic with love. To complete the evening Shahram invites the audience to join him in an ecstatic and meditative whirling experience with Rich's live drum accompaniement. KIRTAN with Shubalananda ~ WELCOME BACK!!!! Join Shubal and myself for a wonderful evening of shared song and ecstatic sacred chant. A divine experience to be had by all. Shubalananda leads it... I'm his accompaniest on hand drums, melodica etc..
As many of you know, Shubal underwent brain surgery in December. This will be his first return to the area and he is still in the process of healing and recovery. Please consider making the time to come out to this one in support of Shubal and to give good vibes and energy toward his ongoing healing. 540 Delaware Avenue, Albany, NY, Donations invited. But no required admission charge. 8th Annual Women's Wellness Weekend, sponsored by Natural Health Magazine. I will be leading an Ecstatic Hand Drumming & Rhythm workshop on Friday evening with Adrian Bennett, and an Explorations in Transformational Sound workshop on Saturday evening. On Saturday morning Adrian and I will be accompanying Toni Bergen's Journey Dance workshop. transmissions, performed on a wide array of exotic and rare world instruments. In addition to traditional performance, elements of Sound Meditation and ancient mantra will be engaged as Rich draws on over 25 years of varied musical experience and transformational energy practices. With my good friend AlySun Panichi guest appearing on vocals!! transmissions and good old/new contemporary folk/rock/etc songs, performed on a wide array of exotic and rare world instruments, in a DOUBLE BILL/DUO performance with vocalist, songwriter, poet Alysun Panichi. FREE Admission: However, outlandishly generous donations graciously accepted!! There is an enormous resurgence of interest in the 13th century mystical Persian poet Rumi. He is the greatest exponent of the ecstatic intoxication of sacred love. Shahram Shiva, Rumi translator and author, captures the essence of the poet's message through his passionate performances. The union of spoken verse and live music - Rich Goodhart on stringed, wind and percussive world instruments - melds magic with love. 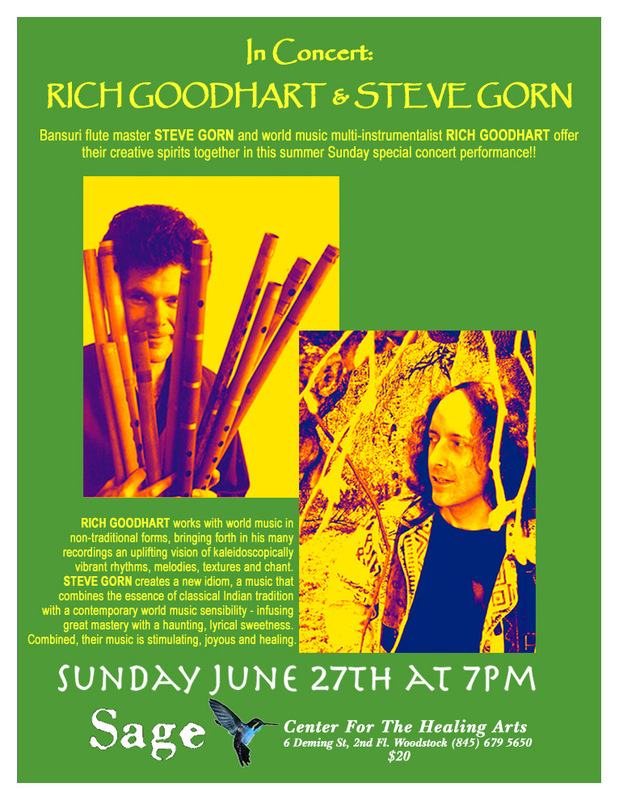 With special guest John Ragusa on flutes.To complete the evening Shahram invites the audience to join him in an ecstatic and meditative whirling experience with Rich's live drum accompaniement. Highly improvisational World Music duo. John and I have been playing together for more than 20 years and have developed a unique performance art. We share a common interest in making music that comes from the heart, drawn from many sources but authentically our own. "An intimate and dynamic coalescence of world music, inventive visions and jazz." There is a $10 admission charge for visiting attendees. Free to Omega workshop participants and staff. Both Solo performances and duets and trios with various friends from Omega's Summer Staff. Free to Omega workshop participants and staff. A retreat featuring, yoga, meditation, tai chi/qigong, sound healing, massage, music and dancing. Where you could also, swim, canoe, hike, kayak and sail. I'll be teaching Qigong and Sound Healing workshops at this event on Saturday and Sunday as well as performing music at the opening ceremony Friday evening. Sound, spirit and energy... music performance with an emphasis on the healing and consciousness transforming powers of sound. More of a ritual immersion in Sound than a "performance". This year we dedicate our music and sound sharing to our dear friend, colleague and mentor SARUAH BENSON who left this earth dimension on April 2nd of last year. For more on SARUAH, please visit here & here. Copyright 2018 Rich Goodhart/Beginner's Mind Productions.